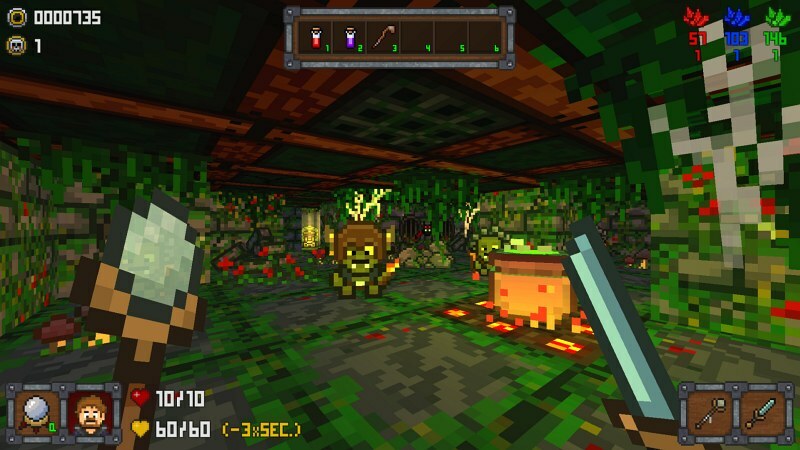 We've just been given the heads up by our good friend Methanoid, of a first person dungeon crawler that has a touch of Delver and a dab of Hexen all mashed up into a procedurally generated retro inspired game. This is ' One More Dungeon '; a recently updated game by Stately Snail that features over 30 types of enemies, 80 lootable items, parallel universes with manually created locations, sanity levels reduced by artefacts, a set of mutators, and lots of different designed dungeons that makes each play through feel like a new experience. In this game you play as the nameless adventure seeker and must use a multitude of weaponry such as swords, magic staffs and unique artefacts, to battle evil creatures and reach the final level of the dungeon and destroy the obelisks, which is being used by forces of Evil to invade the world. If that sounds like your sort of dungeoneering fun, head on over to the Steam Page as it's currently on sale for £1.99 for PC, MAC and Linux.